Color: Light brown to dark reddish brown. Grain: High in character, with ingrown bark and mineral streaks. Most commonly used in flooring as end-grain block, which has small irregular cracks radiating across the grain. Variations Within Species And Grades: One grade; moderate color variations. Hardness/Janka: 2345; 82% HARDER THAN Northern red oak. Dimensional Stability: Excellent (change coefficient .00129; 65% more stable than red oak). Durability: Dense and very strong. End-grain cut has excellent resistance to abrasion and shock. Sawing/Machining: Very good machining qualities. 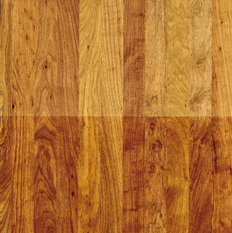 Sanding: Plainsawn can be sanded to a smooth surface; end-grain requires #16 grit sandpaper to flatten. Nailing: Good holding ability, but splits easily. Comments: End-grain block usage results in a hard, high-wear surface. produces only small size boards.